MANDERA, Kenya/BULO HAWO, Somalia, August 1, 2011 (ENS) – Mandera town, on the border between Kenya, Ethiopia and Somalia, is the hub for aid operations in Kenya’s drought-affected Mandera district. It could have been a logistics base for sending help by road to the famine-affected areas in south-central Somalia, but the security risk is high. About four months ago, Al-Shabab militia took over the town of Bulo Hawo on the Somali side, and continue to mount sporadic attacks in the area even though it has been retaken by the authorities. On July 27, the group used a mobile phone to trigger an explosion in Mandera town, killing a Kenyan police officer a few hundred meters from a United Nations office. The border between Kenya and Somalia is not defined by any geographic or ethnic boundary – there are Somalis on either side. The town is the capital of Mandera district, where most nongovernmental organizations and UN agencies responding to the drought are based. “We expect the attacks by the militia to increase,” an aid worker told IRIN, the news service of the UN Office for the Coordination of Humanitarian Affairs. Police have increasingly come under fire on either side of the border. 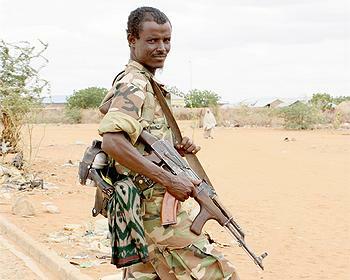 In mid-July, bullets were flying over the two linked towns, resulting in the death of a senior police official employed by Somalia’s Transitional Federal Government (TFG) which now controls Bulo Hawo. International aid workers are required to travel with armed police escorts at all times. Drought conditions in the Horn of Africa region coupled with conflict in Somalia, has affected over 13 million people in the region. Opinions vary on whether the tense security situation in Mandera town and neighboring areas could deteriorate. Leparmorijo said the attacks would have no bearing on aid delivery. “I am talking to the TFG officials on the other side regularly … about security measures,” he said. Ethiopian troops, supporting the TFG, also man the border in Bulo Hawo and intervene when necessary. Local NGOs say they are not the targets of the Al-Shabab attacks, but the authorities are, and this would not affect aid operations. “I don’t think the militia want to upset the local people – they will lose any chance of gaining popular support,” said an aid worker. In recent weeks, most international aid staff have been advised not to travel to Mandera, so agencies rely mostly on national staff and local partners. However, Adan Mohammed Siyad, a senior TFG official from the neighboring Gedo region in Somalia, dismissed security concerns. “We can handle all aid through Mandera to Somalia – the security situation is not bad,” he said. 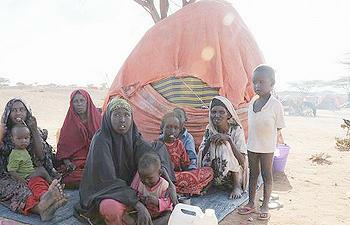 The TFG and the Kenyan authorities are keen that Somalis are helped in their own country. He said at least five to six people are dying of hunger in Doolow daily. Leparmorijo has won plaudits on both sides for opening up the border between Somalia and Kenya in Mandera informally, helping supply essential foods to Somalia. The roads in Bulo Hawo are in a state of disrepair, as are the few vehicles using them. A bullet-ridden building that served as Al-Shabab headquarters has been turned into a private hospital. 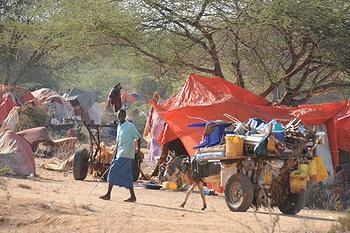 An uneasy sense of calm prevails in Mandera town. There is talk of a military offensive in the local media. But farther inside the district, non-existent roads rather than security pose the biggest threat to timely aid delivery. Parts of Mandera district have not had adequate rainfall for more than a year and none is expected for another three months. Almost every aid organization and government official acknowledges that the supply of relief food and water needs to be stepped up. The few remaining water points are expected to dry out at any time. The western area has recorded a global acute malnutrition rate of more than 31 percent – one of the highest worldwide. The district hospital authorities said they have been notified of at least two infant deaths related to malnutrition over the past three months. Nur Haji Osman, chief of Malkamari village in central Mandera, said he recorded seven hunger-related deaths in April and May, when the village ran out of water and pasture land.